 Jay Michaelson – Founder of HandsOn Gloves the revolutionary pet bath/grooming glove -the perfect Valentine’s Day gift for pets and pet lovers – please visit ‎www.handsongloves.com enter “DIVA”for FREE SHIPPING! 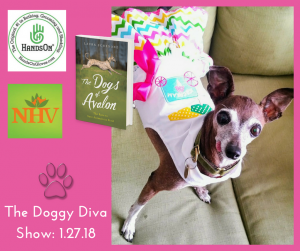  Patra DeSilva – CEO of NHV Natural Pet Products shares helpful information for pet parents to keep their pets healthy with holistic remedies for cats and dogs. www.nhvnaturalpetproducts.com.